Naples, Italy, end of the 15th century. Abbé Celotti; his sale, London, Sotheby's, Mar. 14, 1825, lot 109; Sir Thomas Phillipps (ms. 921); Katherine Fenwick; Thomas FitzRoy Fenwick; Alan George Fenwick; purchased by Curt F. Bühler in Sept. 1953 from William H. Robinson Ltd., London (Cat. 77, no. 47; Cat. 82, no. 514). 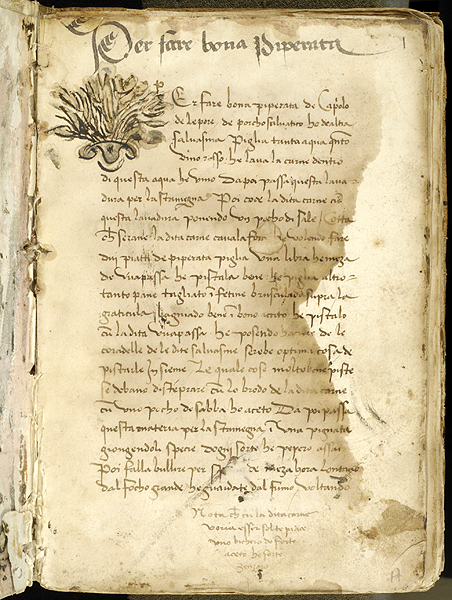 Ms. cookbook; written in Naples at the end of the fifteenth century.